Some things are worth waiting for. We spent years talking to an energy industry entrepreneur about some new concepts he had to help bolster the burgeoning renewable energy sector. After a successful exit, the time was right to pull the trigger on one of these ideas and we were engaged to design and construct a new Software as a Service (SaaS) platform providing operators tools to run community solar farms and other distributed energy generation facilities. Distributed energy generation is an important piece of the renewables market, providing solar, wind and hydro from small distributed sources, bundling those and selling them to end-users using the existing electrical grid for delivery. This allows end-users who don’t have solar panels to benefit and reduce their carbon footprint without the investments needed to install power generation capabilities in their own home or business. Companies and operators that manage solar farms and other distributed generation sources are challenged to provide their customers with the same level of service that they expect from large utilities. Ampion wanted to raise the bar by providing online invoicing, automated bill payment, visualizations of power production, and operational monitoring tools. Throughout our engagement, FM played the roles of acting CTO and development team. With the trust and collaboration of our partner, we were given the space to design, define and build the foundational platform for this business. We not only helped to elicit and define requirements, but we used our best agile practices to design, build & launch this innovative product on time and on budget, despite a rapidly shifting regulatory environment. The Ampion platform includes functionality for both administrators and customers. The platform is optimized for solar, but is flexible enough to handle hydro or wind renewables. 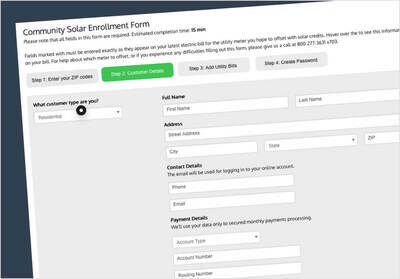 We designed an AngularJS front end paired with a Ruby on Rails back end system that integrated with credit card and ACH gateways for billing and collections, including a sophisticated backup protocol - all completely automated so that administrators could reliably collect payments from customers and be alerted to any potential issues. 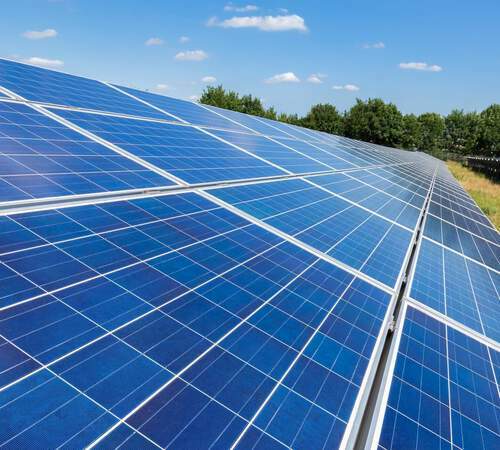 The platform was populated using Internet of Things (iOT) technology, collecting data from devices that monitor output and other attributes of solar arrays. We designed a machine to machine (M2M) interface using the cellular network to transmit this data back to the cloud for analysis. 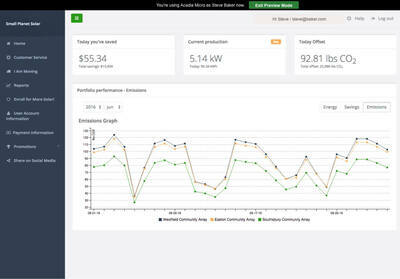 By offering features for billing, collections, allocation, monitoring and analytics to a renewable energy businesses, Ampion provides a sophisticated back-office operational platform so users can operate efficiently and professionally and compete with much larger utilities. As we were wrapping up the initial development of this innovative platform, we worked side by side with the newly formed business to help grow and train an in-house tech team to transition and share our knowledge. We provided training and detailed documentation so they could more quickly ramp up a team to help them support their new product. The product we started building together only a year ago is about to explode in a big way! The evolution of community solar is a classic case of business model innovation turning a challenge into an opportunity. Up & running, signing on customers and managing solar production.